Cubit is a clean and flexible wordpress theme with 6 different cholor schemes(see preview Pics), which is best used for portfolio and business sites. Bluelight is a mash-up of a 2.0 business website and a personal portfolio site. It can be used for either, or both. This template will get you up and running in no time! Levitation is a WordPress Template, best suited for Business and Portfolio sites. It comes with 5 sleek skins and 2 different front page designs (if the WordPress Live Preview is not enough for you, please check out the html templates that are already available, the look stays the same in the WordPress version). Photo Nexus wordpress gallery is a 2 column , 2 color variation ( Bright and Dark) theme. This theme is great for those who need a convenient way to publish and showcase a self managed Gallery of Photos, Artworks or Designs. The theme features modern yet minimalistic style so that your work will be guaranteed to be on focus. The theme comes added with Admin theme options so you won’t need to manually edit the files to get it running. This theme is a complete WordPress Theme, designed from the ground up to function as a comprehensive WordPress theme that can be used for just about any site that needs a beautiful layout. While the frontend design has been popular as a HTML template, the real highlight of this template is a professionally built admin panel that let’s you edit every major content block in the layout quickly and easily without ever opening up a template file. 6 uniquely styled themes (Blue, Green, Pink, Orange, Green, Dark Blue). Sensor is a Premium WordPress Theme suitable for photoblogs, portfolios, showcases, galleries, personal sites and other blogging topics! 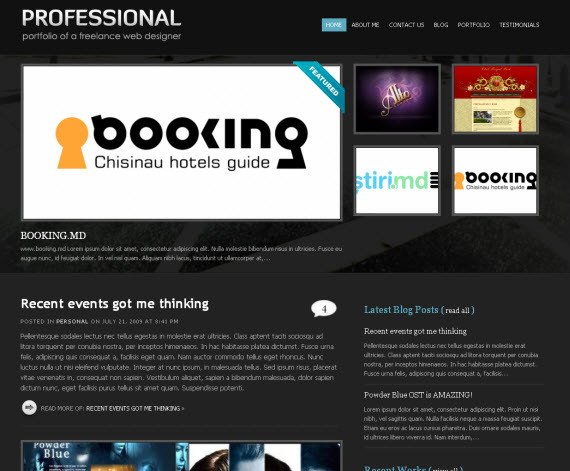 Professional is a theme which can be used as a CMS/Portfolio or as a blog. The very light and flexible layout is based on the “Golden Ratio” principle, having 2 columns. The design mainly emphasizes the content. GALLERY is a premium WordPress theme which can be used for many purposes, including a Photoblog, Portfolio, Personal Blog, Product Reviews, and more! Impulse is a Premium WordPress Theme suitable for portfolios, showcases, galleries, photoblogs, personal sites, endless possibilities! PhotoBlog is an unique portfolio theme for Photographers, Graphic Designers, Architects, etc. With an intuitive layout and a fully widgetized sidebar, it offers the flexibility required in modern blogs. Featured Content on the homepage and in the Sidebar. Number of posts is controlled on the Widgets Page in the Admin Panel. London Creative + comes with fully working contact form, awesome slider for your featured images, nasty spinning slider buttons (never saw them anywhere else, so you can call it unique), 2 message buttons under the slider and PrettyPhoto plugin (better clone of Lightbox). You will also have user-friendly dropdown navigation with infinite dropdown levels where you can style every even list item via Jquery, so no more hassle, it’s automatic, you can just add posts and you are ready to go! Pandora is a WordPress Template, designed to promote anything from a corporate business to a portfolio site. More than 10 professionally-designed and easy customisable themes comes as standard: Aqua, Crimson, Eco, Egypt, Modern, Mystery, Nebula, Ocean, Olive, Parquet, Podium, Startup. 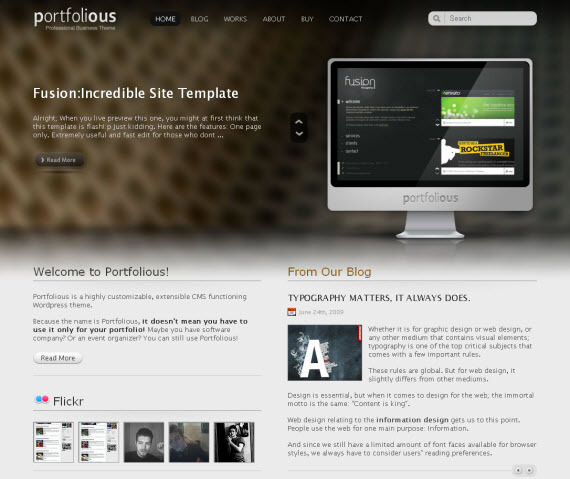 Portfolious is the profesional Fulll WordPress CMS functioning theme for, well anyone! Because the name is Portfolious; it doesn’t mean you have to only use for portfolio blog, because you can change that in Portfolious! Animated and tabbed Theme options with color pickers, sliding content with conditional options, dynamic background switcher. Previous Monofactor blog design, now Gold mine WordPress theme. This theme stands out with it’s quality and it has been featured in most CSS Design galleries with highest rating before some time. Post & Portfolio Item Thumbnails: Easily assign and attach thumbnails to your posts and portfolio items. Jquery Enabled: Flourished with jquery rounded corners and carousel, your blog and portfolio will look hot. Widget ready: Add or change what you want to show on your sidebar. This is a wordpress theme suitable for photographers and graphic & web designers. This is a fun, bold, portfolio theme for WordPress. This theme allows you to showcase your work, while adding subtle personal touches. With a large billboard featured area on the homepage, to large bold, list and post views on the interior pages this theme will enable you to showcase the best of your work. Contrast, a wordpress theme which is suitable for photographers, graphic & web designers, corporates with a kickass features. ourAgency WordPress theme is a fully customizable CMS theme – you can easily create a whole site with a homepage, subpages and a blog. I wanted to make it as user friendly as possible while still giving you full control over your content. FolioTheme is a WP Portfolio Style Theme ideal for photographers, artists or designers. NO Custom Fields! Just put you content right in the post – like magic! Ambiguous Portfolio WordPress theme was developed to showcase your work. Ambiguous has a large featured portfolio items area well placed on the homepage showcasing the best of your work. Also on the homepage are your most recent blog posts. In the sidebar there is a custom twitter feed feature, about widget displaying brief info about yourself, and a site search feature. Gateway Studios, Simplicity Overhaul features a simple yet beautiful design, that will impress your visitors with its delicate form. The theme comes with many great features that just work out of the box, without the need for plugins, making Gateway a very smart decision with everything Integrated. A lot of flexibility has been integrated into the theme, so you can use it from a Personal Site, to a Photography Blog to a complete Studio Website. You have an arsenal of Features and Customization at your disposal, and also a Clean Design created with usability and typography in mind. This is an excellent site also offering some nifty premium WordPress themes, where you can pay 19.95$ and get access to all of their commercial themes for one year. Here I also find my own pick for personal project, so I am saying from personal experience, that I was positively surprised about their great admin panel with big list of modifiying features, so I didn’t even had a need to touch the code at first. Okay, let me finish here and also share your opinions – do you need this type of commercial articles, at least I don’t think anymore that the best stuff is for free, I don’t mind paying for quality and this article definitely proves it! If you buy something please use this site affiliate links to help us improve 1stwebdesigner blog quality! Thank you!